WR30 is in the southern constellation of Carina about 18,500 light years distant. Wolf-Rayet (WR) stars are believed to be the bare cores of evolved massive O-type stars that were�probably larger than 40 solar masses. �With heavy mass loss, such stars can evolve to WR stars of 10 – 20 solar masses, with the rest of their mass having been ejected. �It is the ejected mass that we image�as a beautiful nebula. Many WR stars are now known to have surrounding ring nebula which are believed to be ejecta or interstellar medium (ISM) swept up by the fast stellar winds of the WR star. This process may occur multiple times which can provide information about its evolution. �A. P. Marsten (AstronomJ, 109 (4), April 1995, pp 1839-1845) indicates that WR30 is an example of a WR nebula having multiple ellipsoidal shells; the outermost being approximately 20′ wide and the inner being 10′. My image required many hours of exposure. 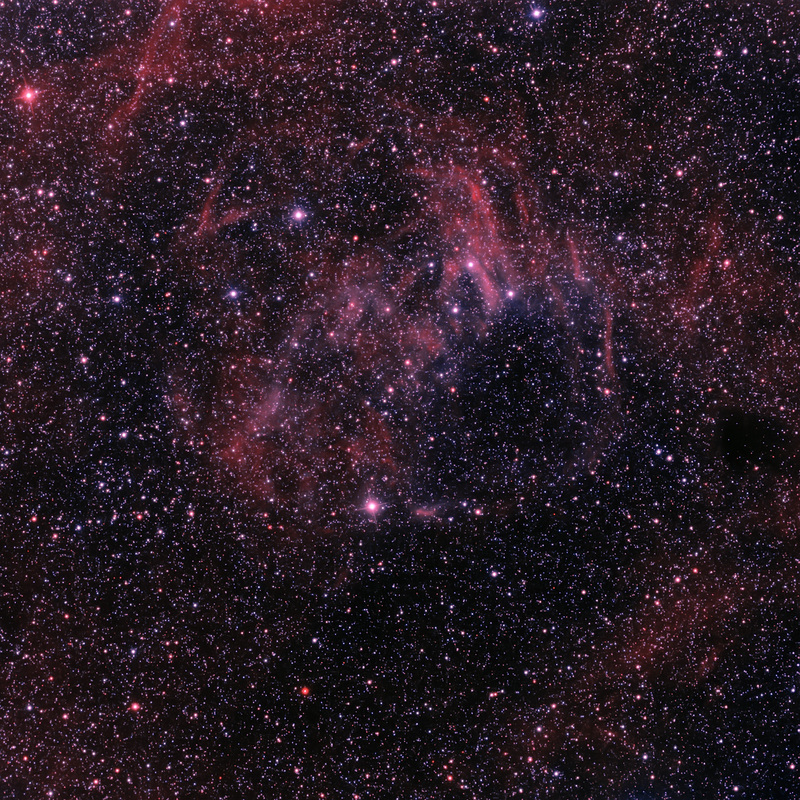 �The WR30 nebula is very faint. �H-a and OIII filters helped to enhance the contrast of these faint features, bringing out the detail in the nebula. �North is up and East is left. �The elliptical nebula is approximately 22′ wide in the EW direction and is a mixture of H-a and OIII. �There is extended H-a emission�and structure throughout the image. �RGB data were added for star colors. � There is a small dust cloud at the west (right) side of the image. �This may be the only color image of WR30. My narrowband data are�consistent with those presented by Marsten. Another rare unphotographed gem in your collection! You’ve done really well considering the sheer faintness of this object. Still plenty more southern WR nebulae to image!